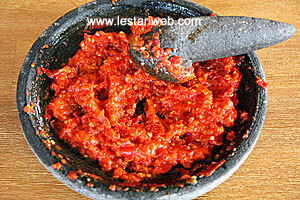 This is another variant of Indonesian Tempe Sambal. I got this recipe from my Sundanese-Grandmother ;-). The unique thing about this sambal is you have to crush or pound the tempe cake until they are fallen apart & scramble in pieces!!! 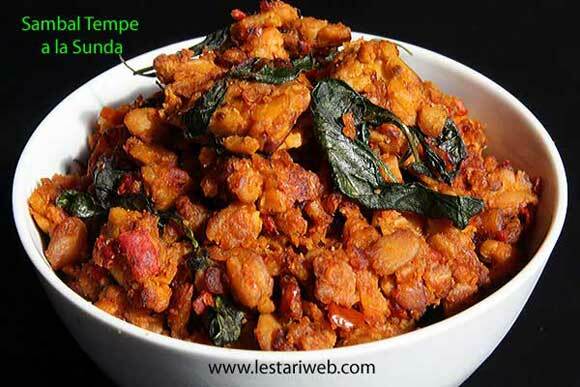 Tipp : Use the fresh tempe to obtain the best taste!! 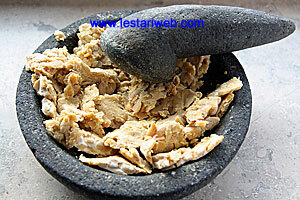 1 Cut tempe in smaller pieces, put on the cobek/mortal then pound/crush with the pestle to get scrambled texture (see pic). Put aside. 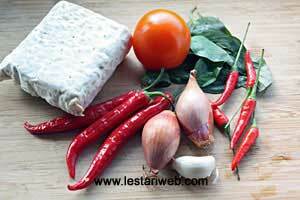 2 Put the chillies, shallot, garlic and tomatoes in a mortar / grinding stone and grind until smooth. (You can also use blender or food processor & blend until smooth. Add little bit oil if necessary to help the blending process). 3 Heat 3 tbsp oil in a Wok or big saucepan. (Don't add oil if already added in a blender). 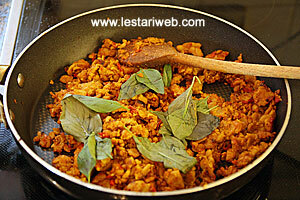 4 Stir-fry sambal paste over medium heat until the oil begins to appear on the surface, take about 5 mins. Stir frequently. 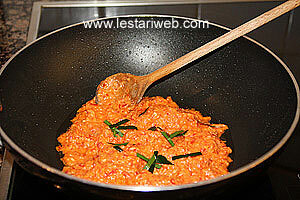 Sambal is done when the liquid had evaporated & the texture becomes scrambled. 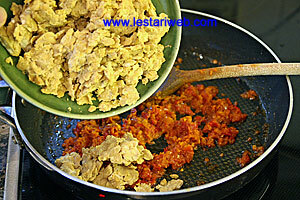 5 Add the pounded tempe, continue to stir-fry until tempe well-cooked & blended well with the sambal (about 5 minutes). 6 Adjust the seasoning, add salt & sugar to taste. Add the basil leaves, stir briefly until just wilted. Remove from heat.